Potato Sausage Casserole: Who wants breakfast? 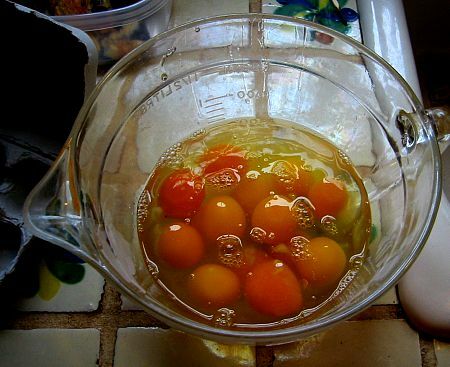 Farm fresh eggs have amazingly bright yolks. I had some friends over for breakfast last Sunday, the perfect occasion to celebrate the best meal of the day. Don’t get me wrong; lunch and dinner are okay, but let’s face it, they share the same menu items. Breakfast is unique enough to hold on to its moniker no matter what time it’s served. When it comes to the Big American Breakfast (BAM), I consider it a gift to the world that rivals such Yankee contributions as the fountain pen, peanut butter, moist towelette, Space Shuttle and waffle cone. I thought I’d keep it simple: fruit, farm fresh eggs scrambled (courtesy of the girls), blueberry scones and my potato sausage breakfast casserole cooked in a cast iron pan the size of a manhole cover. Here’s how you make it. This is a two-person fry pan, use your legs to lower into the oven. Saute the first three items slowly, and caramelize the onions and brown veggie bits and don't overcook the sausage. Drain if really greasy (or if someone healthy is watching). Add the flour and stir, coating the pan and scraping and stirring, cook another minute to create a pasty roux. Add milk in a slow steady stream and stir mixture. Simmer until it thickens. Top with remainder of cheese, cover with foil or lid and cook at 350 degrees for an hour. Remove lid or foil and cook another 30 minutes or until golden brown and potatoes tender. Now you’re ready to climb a mountain or plow your back forty or collapse on the sofa with The New York Times. With a full stomach, Sunday is yours to decide. Next articleFlower Garden or Salad Bar for Deer? I love eggs. That’s really a beautiful photo. I need some girls to lay me some eggs, because the supermarket eggs sure aren’t as pretty and probably not half as flavorful. I could go for one of your scones right now!!! I actually ate this dish – it was delicious! Second helpings! Your food looks delicious! and I’m a vegetarian…. Does your cast iron frying pan have a nick name? Monon perhaps?